Amid growing concerns about air quality and its link to poor health, London’s mayor, Sadiq Khan, brought forward the introduction of the Ultra Low Emission Zone by a year. It comes into operation on 8 April 2019. From 8 April 2019, the Ultra Low Emission Zone (ULEZ) will replace the T-Charge (toxicity charge), which charged drivers of older, higher-polluting vehicles an additional fee for driving in the congestion charge (CC) zone. The ULEZ covers the same area, see map below, but unlike the congestion charge will be in place 24 hours a day, seven days a week. The ULEZ charge will be £12.50 per day for the more-polluting cars and vans and £100 for heavy duty commercial vehicles such as buses, coaches and goods vehicles. Road signs will mark where the ULEZ starts, and the signs will sit alongside or below existing Congestion Charge signs at every entry point along the boundary and along key approaches. Advance warning signs will appear on major roads roughly half a mile from the ULEZ boundary, so you can decide whether or not to proceed. Cameras will read numbers plates and use automatic number plate recognition (ANPR) to check them against a database to determine if they meet the emissions standards. Which vehicles will have to pay the ULEZ charge? In general, it is older, more heavily polluting vehicles that will have to pay the ULEZ charge. You can find out whether you will have to pay the charge if you drive your vehicle into the zone by entering your registration number into the ‘Check your vehicle’ tool on the TfL website. Alternatively, you can check the emissions level of your vehicle on your V5C registration document (also known as the log book) - for cars it needs to be 80mg/km (0.08g/km) for NOx or less. Diesel vehicles - Euro 6 (generally registered after Sept 2015). Motorcycles, mopeds, motorised tricycles and quadricycles - Euro 3. Lorries, buses, coaches and other specialist vehicles - Euro VI. If your vehicle doesn’t meet these emission standards, you will be charged based on the vehicle that you drive. Cars and vans will attract a £12.50 charge for each day they are in the zone and heavy duty vehicles £100 per day. Some exemptions and discounts will apply to the ULEZ charge until 24 October 2021, such as for charity minibuses, taxis and residents of the congestion charge zone. The mayor has also set up a van scrappage fund for microbusinesses and charities prepare for the arrival of the ULEZ. 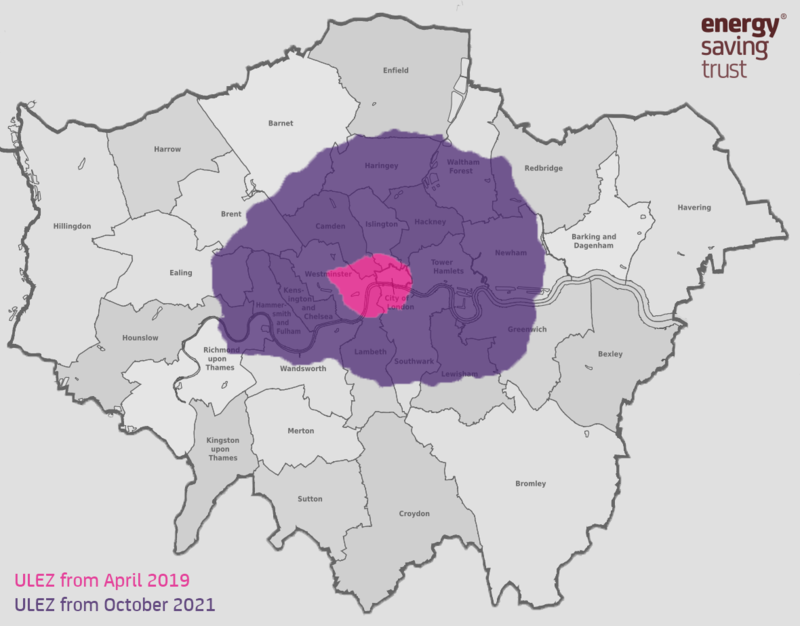 As of 25 October 2021, the ULEZ boundary will expand to cover the area confined by the North and South Circular Roads for all vehicles. Vans and heavy duty vehicles already need to comply with a Low Emission Zone (which covers all Greater London) and this zone will continue to be enforced. In 2020, the Low Emission Zone standards for heavy duty vehicles will come into line with the Ultra Low Emission Zone standards. Petrol vans, however, will continue to be held to the existing Euro 3 standard within the Low Emission Zone, while they’ll need to comply to the higher Euro 4 standards within the Ultra Low Emission Zone. The Ultra Low Emission Zone is there to encourage people to choose less polluting options, and improve London’s air quality. To avoid the charge, you have two main options: use lower emitting vehicles, or avoid driving within the zone. If your vehicle is liable for the ULEZ charge, we’d recommend switching to a cleaner vehicle, in order to reduce emissions as well as lower costs over time. Driving an electric vehicle will mean you comply with the current emission standards, as well as qualifying for a 100% discount on the congestion charge (the Cleaner Vehicle Discount or CVD), which is due to remain in place until December 2025. Some hybrid vehicles can also qualify for the 100% discount until October 2021, although not all will meet the necessary standard. You can check the details of discounts and exemptions on the TfL site. If you’re thinking of switching to an electric vehicle, it doesn’t have to break the bank. The market for second-hand electric vehicles is growing fast. You can use Energy Saving Trust’s Used EV Calculator to help you decide what second hand vehicle would suit you best. If you operate heavier vehicles such as buses, coaches, HGVs, or similar, retrofitters verified by the Energy Saving Trust’s Clean Vehicle Retrofit Accreditation Scheme can help you reach these emission standards in a more budget-friendly way. 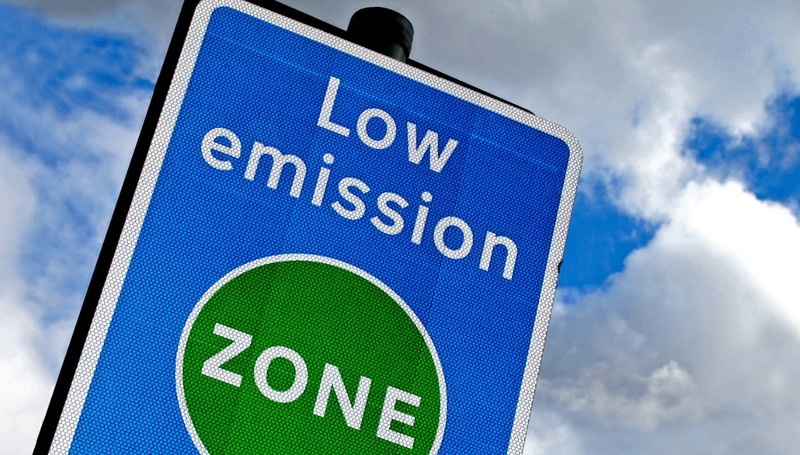 London’s Ultra Low Emission Zone is a type of Clean Air Zone, several of which have been introduced across the country to improve air quality. They can cover anything from a single street to an entire section of a city, and can potentially include an area in which non-compliant vehicles can be charged or pay a penalty. The government has instructed five cities to introduce a Clean Air Zone as a means to comply with air quality targets, namely Birmingham, Derby, Leeds, Nottingham and Southampton. 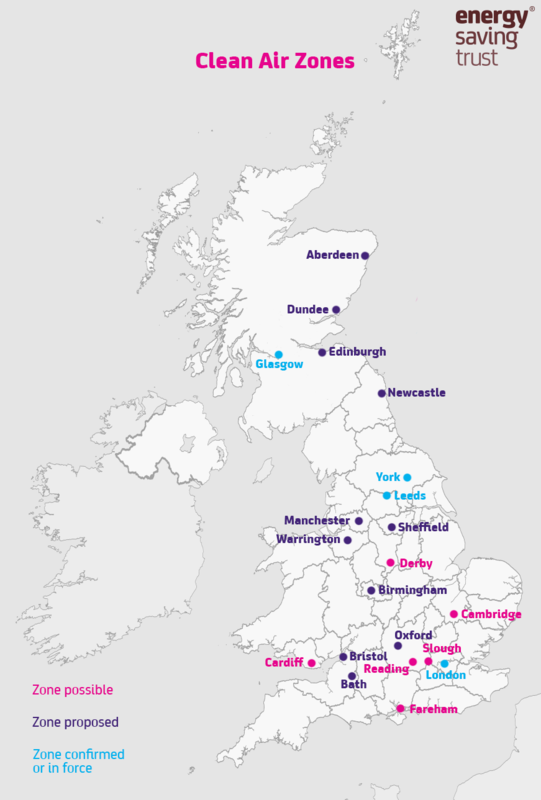 There are a further 23 local authorities where recorded levels of NO2 exceed regulated limits. The government requires these areas to commit to action plans to bring about compliance in as short a time as possible. These local authorities are in the process of carrying out feasibility studies to see if they will need to implement a Clean Air Zone, to improve local air quality. The map below shows you where Clean Air Zones are possible, proposed, or are confirmed or in force already.